The deadly shelling of the city of Mariupol in south-eastern Ukraine has been caught on a car dashcam, with the terrified driver barely escaping with his life after a car in front him was blown to pieces. 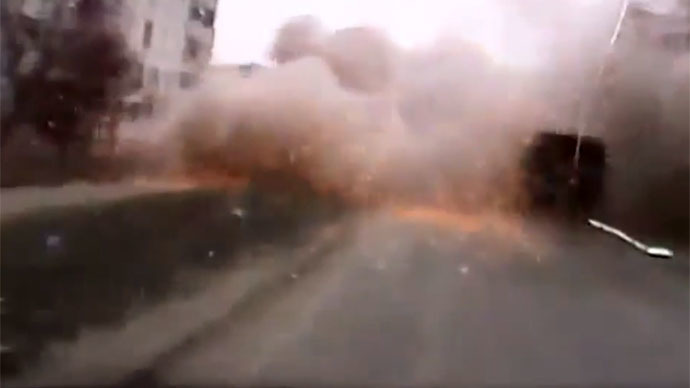 The video, uploaded by local resident Viktor Zubritsky, shows several shells landing in a residential area of Mariupol and blowing up a moving truck in front. At least 30 people were killed and another 100 were injured when the center of port city, which has remained relatively insulated from violence throughout the majority of the Ukrainian conflict, was bombarded on Saturday. The shells – allegedly fired from Grad and Uragan multiple rocket launchers – hit a local market, schools, shops and private homes. The Kiev forces and the militias, who have been fighting in south-eastern Ukraine since last April, have been trading blame for the incident.